Although it appears that the performance this month was quite good it was actually a rather poor month. Of the $14,000 incrase compared to last month, $12,000 of this was due to an updating of my superannuation figures which had not been updated since I started tracking my networth. For the month of March I am currently forecasting my first negative returns since I started tracking my net worth. 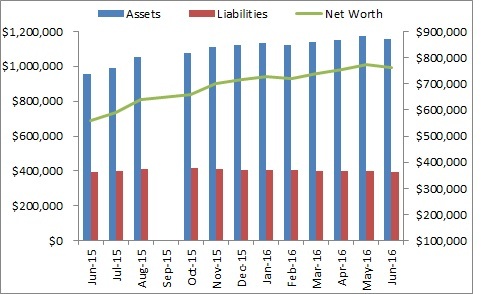 In down months my net worth has been driven by inclusion of amounts previously not included (mainly around superannuation) and also the relatively frequent allocation of cash to my loan offset account. In March I will have virtually no cash to allocate to my offset account as most of my wage will go towards paying down my credit card debt. As indicated in my January 2012 personal expenditure tracker post, I am broadly keeping in line with my investing goals however my personal expenditure was far away from my goal and this month is actually looking significantly worse. I spend a LOT on eating out. For me to spend $60 - $80 on a dinner is not unusual. I think there is a pressure to go to the best places and not worry about the cost because I am seen to be earning well (and my professional friends tend to have the same attitude. The above represents a standard to a quieter Friday night and there is $140 - $160 of expenditure right there. That could easily go up to $250 if I am going out partying. On a monthly basis this works out to ~1 / 3 - 1 / 2 of my monthly personal expenditure without including things like memberships (gym etc), charities, hobbies, rent etc. Over the next month I'm going to see if I can exercise some self control and will post about my progress. As I write this post, the Australian dollar is back close to all time highs against the USD ($1.0804), it has reached 27 year highs against the GBP (0.6795) and is at all time highs against the Euro (0.8147). I have previously posted that a good way to take advantage of this is to invest in undervalued foreign indexes / stocks when your home exchange rate is high so you get the double benefit of a recovery in the stock price and the benefit of downside protection due to an expected improvement in the currency (note that this protection is over the long term). The problem I am currently facing is that stocks had their best start to the year in a decade in January in almost all markets. This means that the case for investing in those stock markets on their own merit is not as strong as it otherwise would have been. I have been looking at other products to see if the idea can be replicated. Interest rate products in the US / UK and Europe are not attractive to Australian investors currently as their low yields (1 - 3%) are far below what could be achieved by investing in Australian bank stocks (6 - 8%). An alternative I looked into was also buying and holding foreign currency. The opportunity cost of this money however is the interest / dividend yield I could be earning while invested in other products. Options offer an attractive way to gain exposure at a lower cost however their costs tend to be very high and as they are OTC products making a small investment to 'test the waters' does not appear possible. I am leaning towards putting my money into a German micro cap stock that I believe in as the stock is not affected by European woes (Chinese based company listed in Germany). The exchange rate for the Euro is outrageous and if the Eurozone was to come up with a solution for their current woes the currency would immediately snap back. I was relatively happy with my combined investment performance. Effectively I was only $200 below my target and this will balance out in the coming month as I allocate money to my offset account and not to my share investments. The part that I found most difficult (as evidenced above) was personal expenditure. The problem that I have when I look at my performance is that I know in the next month I am going to increase this deficit as my credit card bill for February has already come through and it is not an improved situation. I suspect that I've underestimated my own cost of living (i.e. I can probably live on $1,500 a month but I'm not sure that I want to) and will continue to evaluate over the coming months whether this is an unrealistic objective.